Canoe is a name given to small and lightweight watercraft normally propelled by means of single-blade paddles. Typically, a canoe is bigger than a kayak, and it’s primary application is carrying two passengers or more. 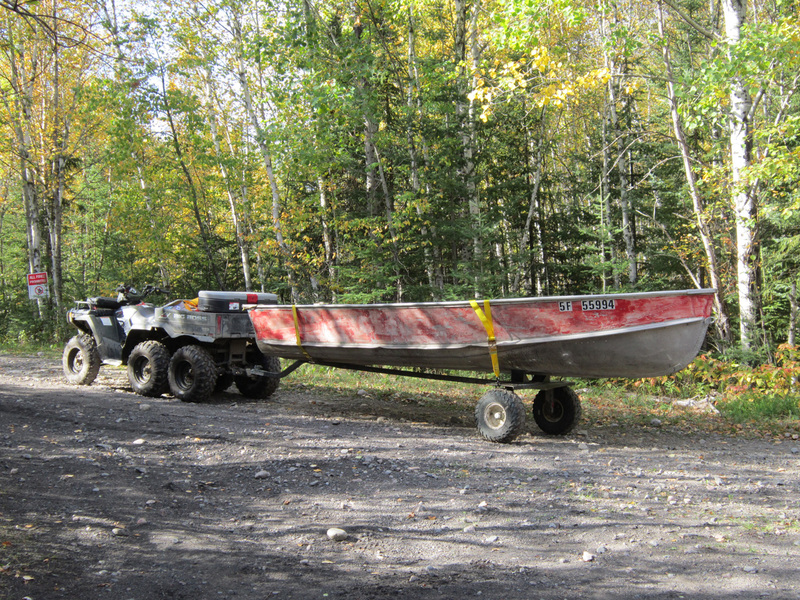 Some canoes can be motorized. Portable boats have been around for decades, and over time, they have gained many fans, as well as opponents. 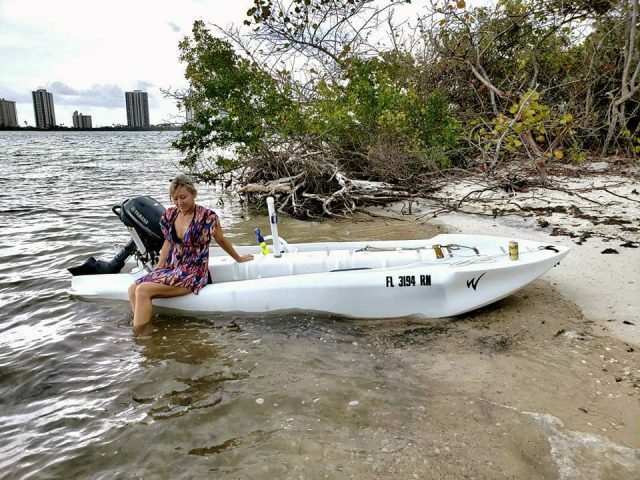 This article is an attempt to shed more light on this subject, clarify the basic things that are worth knowing, determine factors that should be given consideration when deciding whether to buy a portable boat or not, and which type, as well as offer information on the latest developments in this field. Special attention is given to Wavewalk’s Series 4 (S4), a new type of portable boat based on the company’s patented invention. The S4 is good new for those who are looking to get a high performance car-top boat without compromising on stability, comfort and dryness. Make sure to set the YouTube player to watching the videos on this playlist in 1080p HD Hi-Definition. Use the > button to play the next movie, and the < button to return to the previous one. 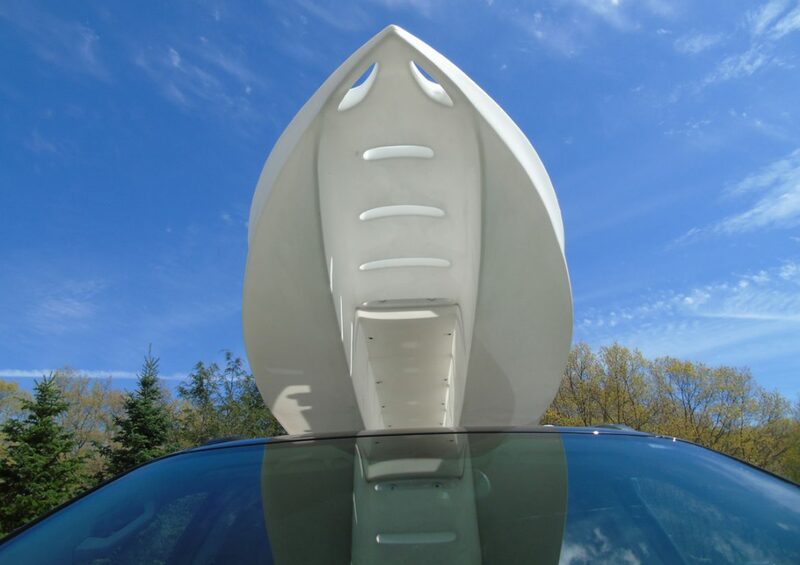 A portable boat is a small boat that’s lightweight enough for a person to upload onto their vehicle’s roof rack in order to transport it this way. A portable boat must also be lightweight enough for one person to carry by hand from their vehicle to the water, and back. In other words, a portable boat is a car-top boat, and vice versa. This is to say that portable boats do not require transportation by trailer. But not all trailer-free boats offer the same degree of portability, and some small dinghies, Jon boats and motorized boards may be hauled onto a pickup truck bed, but still be too heavy and bulky for either car topping or easy carrying. Therefore, these small boat are not true portable boats. Kayaks are not considered to be portable boats despite their being small and typically lightweight enough to be car topped and carried by hand. 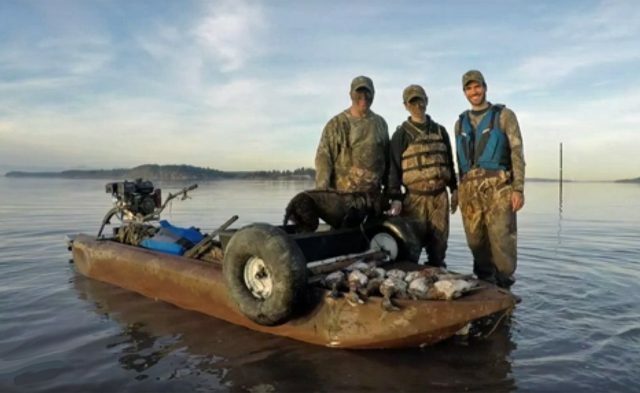 This is because kayaks don’t lend themselves to effective motorizing, and the same is true for canoes, with the exception for square-stern canoes designed to accommodate a small outboard motor, and be driven on flat water. 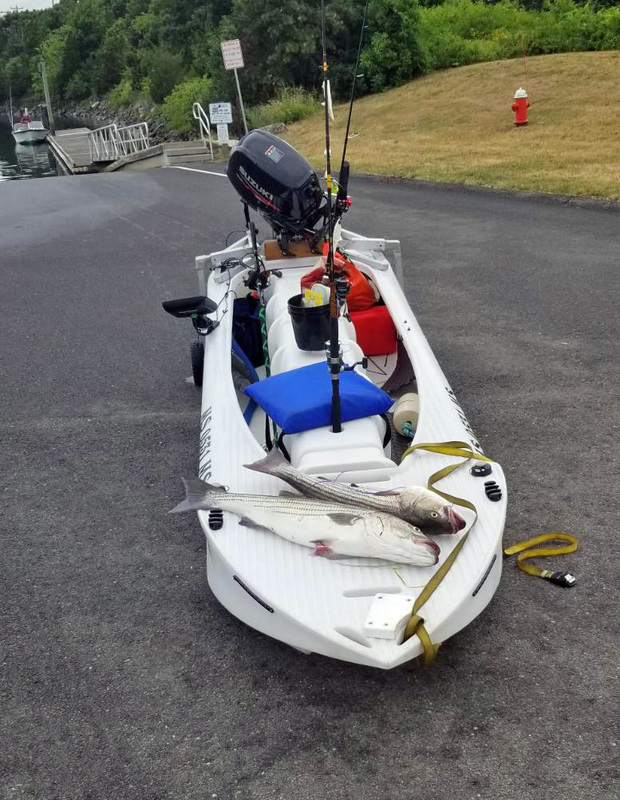 Kayaks with built-in electric trolling motors are not portable boats either, since their motors are extremely weak in comparison to the smallest portable outboard gas engines that power boats. Only a vessel that is both a boat in the full sense of functionality and comfort expected from a motorboat, as well fully portable, may qualify as a portable boat. Are motorized boards portable boats? Motorized boards are vessels that offer neither minimal free board nor sufficient load capacity to count as boats. Ironically, some of them are too heavy to be car-topped, which is yet another reason why they may not count as portable boats. Portability can save you both time and money. In dollar terms, portability saves you the money that you would have spent on a boat trailer. 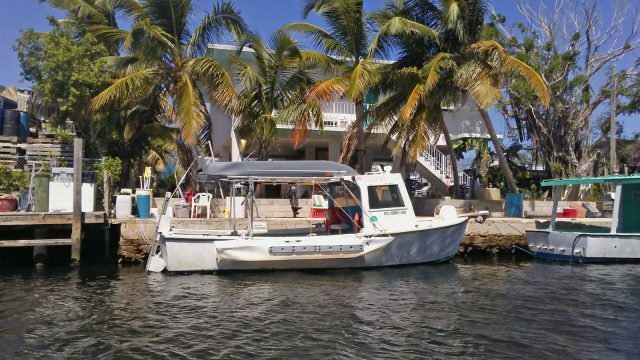 It’s always good to have a few extra dollars to spend on the boat itself, or on fishing gear. However, what’s more important is the fact that a portable boat saves you time that you can spent having fun on the water, instead of on the road, driving to or from a boat ramp, as boat ramps are the only places that allow you to launch a boat from a trailer. By the same token, a portable boat saves you waiting time at the boat ramp, waiting for other boat owners to launch their boats, or take them out before you could do it with your own boat. Owning a car-top boat guarantees that you’d never arrive to a boat ramp just to find that the facility had run out of parking space for your vehicle and your boat trailer. Simply put, portability frees you to launch anywhere you want, and in the case of the S4, even in rocky beaches a.k.a. “Rock Gardens”, as seen in one of the videos featuring in the above playlist. Portable boats include dinghies, Jon boats and square-stern canoes that are small and lightweight enough for car topping. Typically, such boats are made from aluminum (welded or riveted), fiberglass, or plastic resin such as Polyethylene (PE). A rigid hull offers the advantage of being ready to go on water without spending time and energy on inflating and assembly. As soon as they are out of the water, rigid-hull portable boats (RIB) cannot be car-topped without deflating or disassembling them. One of the drawbacks of a car-topped boat compared to a boat transported on a trailer is that with a car-top boat, you have to mount the outboard motor on the boat before you launch, and dismount it at the end of the trip, so you could transport it inside your vehicle. This said, an experienced boat owner can mount and dismount a small, namely portable outboard motor within a couple of minutes. A folding hull is made from rigid panels attached by flexible sections. Folding a boat makes it take less space, and being less bulky can be an advantage for transportation. Upon arrival to the launching spot, a folding hull needs to be unfolded, and the boat requires assembly for its seats, transom, etc., which can take up to twenty minutes. 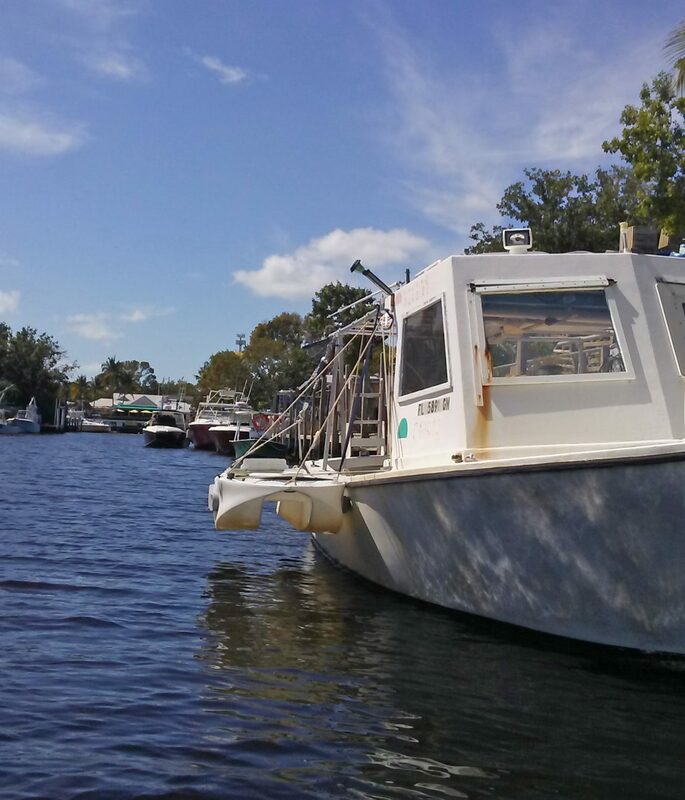 Disassembling the boat and folding it back can take a similar time, and altogether, whatever time is gained as a result of not having to launch at a boat ramp thanks to the lack of a trailer, might be wasted on tedious assembly and disassembly work. Inflatable dinghies are made from soft parts, and rigid inflatable boats (RIB) have rigid parts too, which require both assembly and inflation before launching, and disassembly as well as deflation and folding at the end of the trip. These extra activities can take considerable time, even for an experienced user with a good electric pump. Generally speaking, anglers typically prefer not to fish out of inflatable boats because of the risk of a fishing hook or a knife perforating the hull. Some small catamarans may be transported on top of a vehicle. These boats feature closed rigid hulls namely pontoons, and their decks are made from sections that can be assembled for boating, and disassembled to allow transportation on a vehicle. Typically, these are sailing catamarans, and they are rarely used for fishing. The need to compact the boat so it could be car-topped leads to some portable boat designs lacking in seaworthiness, stability, and comfort. Canoes feature either round bottomed or flat bottomed hulls. The first is extremely tippy and prone to rolling, especially for a crew of more than one, and the latter is stabler on flat water, but insufficiently stable in choppy water, and in the presence of powerboats’ wakes. Jon boats, aluminum dinghies and micro skiffs that feature a flat bottom hull are moderately stable on flat water, especially if they are very wide, but they lack the stability required for driving and fishing in moving water. Jon boats, dinghies and skiffs with a shallow V hull are more stable in moving water, but less stable on flat water. Inflatable dinghies are very wide, and they are designed to allow driving in moving water, but these boats are not comfortable. Small, compact boats are not the most comfortable, with the exception of the S4, which features a large-size saddle resembling the saddle seats found in bigger personal watercraft (PWC) sometimes called jet-skis. The S4’s saddle combined its twin-hull design delivers the highest performance in terms of balancing, namely the users’ ability to react instantly, intuitively and effortlessly to changes, as well as actively balance the boat. The S4’s stability combined with the effective balancing capabilities it offers to its users contribute to its exceptional seaworthiness. Which car-top boat is the most portable? A boat’s portability is affected mainly by its weight. The S4 weighs a little less than 100 lbs without a motor, and this makes it the lightest boat relatively to its load capacity of over 600 lbs. The S4 also features a fully rigid twin-hull that requires no time-consuming inflation or assembly. Therefore, it is fair to say that the S4 is the world’s most portable boat. Which portable boat is the most stable? Which portable boat is the most seaworthy? This question is more difficult to answer, since many inflatable and rigid-inflatable dinghies are very wide and designed to go in rough water. However, for a rigid hull portable boat, the Wavewalk S4 is the most seaworthy, since it can go in the ocean in waves up to 5 ft, and its driver can drive it in waves while they stand. What is the most comfortable portable boat? Portable boats usually come with simple bench-like seats, or basic swivel seats. Inflatable dinghies offer the driver and sometimes the passengers to sit on its inflatable chambers, or pontoons. Such seating accommodations are not ergonomically designed, which is why they are rather uncomfortable. On top of this, such crude seats do not provide boaters with effective means to o balance themselves, and this balancing deficiency becomes a severe comfort problem in rough water, as well as on longer trips. The Wavewalk S4 is the only portable boat that features an ergonomically designed PWC saddle-seat. These seats prevent back pain and they offer their users means for quick and efficient reaction to change, as well as easy, natural, intuitive, and highly effective balancing, including whilr going in rough water. S4 driver and passengers can face forward while they ride (straddle) the saddle with a foot in each hull, and they can also face sideways while sitting side-saddle with both feet in one hull. This works not just for small size people as well as for big and heavy guys. The above video playlist includes a movie showing an angler who weighs 330 lbs enjoying driving an S4 and fishing from it while seated side-saddle. Which portable boat is the most versatile? The Wavewalk S4 is hands down the most versatile portable boat, due to multiple reasons. These include the fact that the S4 works perfectly as a paddle craft both in a canoeing and kayaking mode. 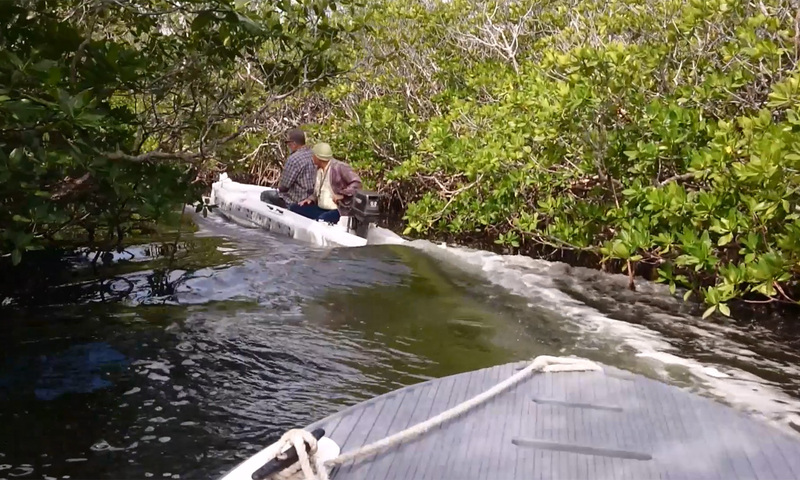 This excellent performance in a human powered mode is unique among motorboats, and it is important not just as an alternative for motorizing in case of emergency, such as engine problems, getting stranded at low tide, etc., but also for going in extremely shallow water (skinny water) where even small and lightweight boats draft too much. This is to say that the S4 is unbeatable as far as mobility is concerned. The S4 also works both in a solo and tandem mode with up to three adult passengers, and it features a frontal casting deck, as skiffs do. The S4’s seaworthiness is so good that it can serve as a fun boat for playing in waves. The S4 can also be easily towed by a bigger boat or hauled on board, and together with its generous load capacity, these attributes turn it into a most effective boat tender for yachts and big boats. The following images offer a quick, condensed glimpse into various aspects of the S4, both as a car-top motorboat and a paddle craft, for leisure and fishing. For a better insight on the S4’s capabilities watch movies in the above playlist. 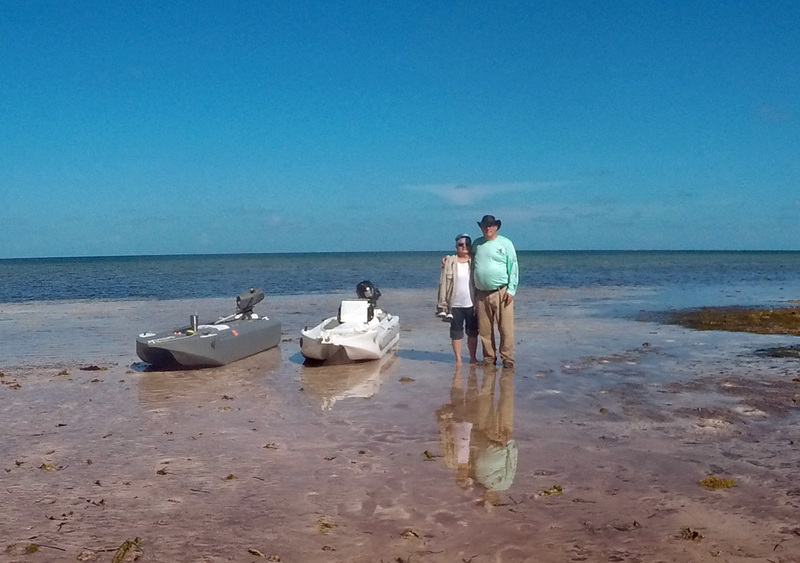 Skiffs come in different sizes and configurations, and similarly to Jon boats, they are flat bottomed mono-hulls, a feature that reduces draft, which is advantageous for fishing in shallow water. But this design feature also makes skiffs less seaworthy compared to other boats of similar size. This is yet another example of specialization that enhances the product’s performance in one application while diminishing its performance in others. 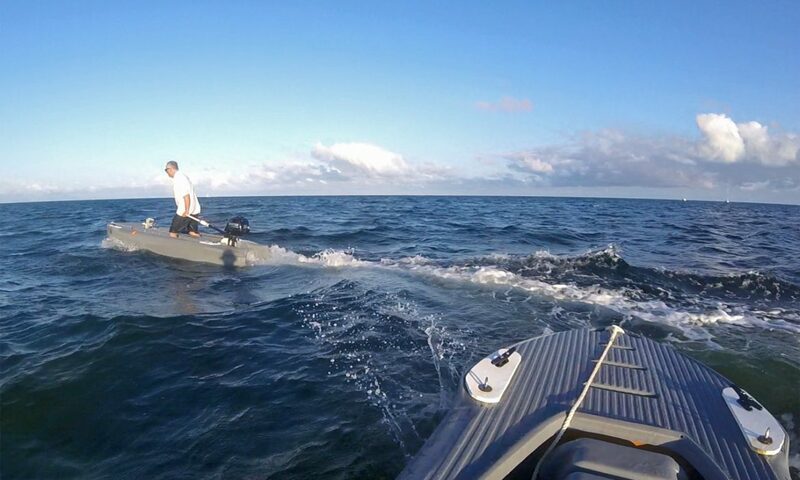 Skiffs’ limited seaworthiness is the reason for their being unpopular as boats for offshore fishing, and opinions about their performance in bays and estuaries are mixed. The skiff design’s limited seaworthiness is one of the reasons why owners of big boats and yachts don’t use small skiffs dubbed microskiff as tenders. Typically, skiffs’ hulls are molded from fiberglass, mainly because this material is more durable in saltwater than aluminum, which is the most common building material in Jon boats. However, fiberglass doesn’t perform well in terms of impact resistance, and it requires maintenance, while other polymer resins (plastics) such as Polyethylene don’t. 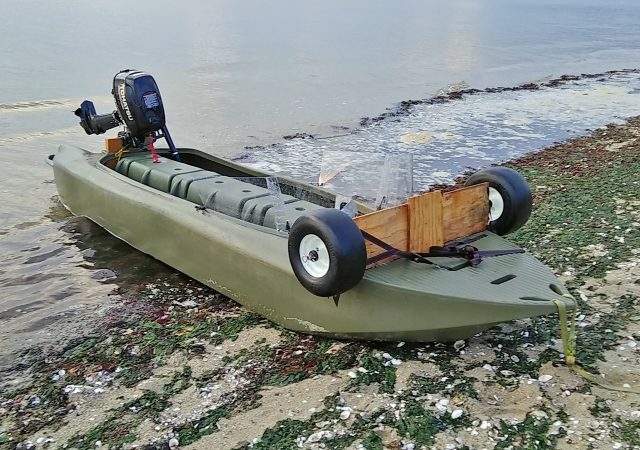 Fiberglass is also heavier than Polyethylene, too heavy to make a small skiff that’s lightweight enough to be transported on top of a vehicle’s roof, namely a portable skiff. Skiffs are propelled by one or more outboard motors mounted at their stern. Depending on a skiff’s size and level of outfitting, it may feature a center console, a casting platform at its front, and a tall structure at the stern, for a person to use for poling and/or for sighting fish for one or more anglers fishing from the deck. Skiff are sometimes outfitted with an electric trolling motor, typically mounted at their bow. The main advantages of a frontal casting platform are that it offers the angler a broader range of casting, be it with bait, lures, flies, or a fishing net, and it puts a bigger distance between them and other fishers working from the middle of the deck. The main advantage of a center console is that it improves the driver’s comfort and stability, relatively to driving from the stern, and it allows them to drive standing. Poling is both exhausting and rather ineffective as a mode of propulsion, and therefore increasingly unpopular among anglers who fish the flats and other shallow water. This leaves the poling platform to serve mainly as a watchtower, and possibly as an ornament. Electric trolling motors are quiet, and they can be controlled remotely, which is one of the reasons that more skiff owners use them these days. Microskiff is a term that refers to compact skiffs, namely of small size, and typically of reduced features as well. 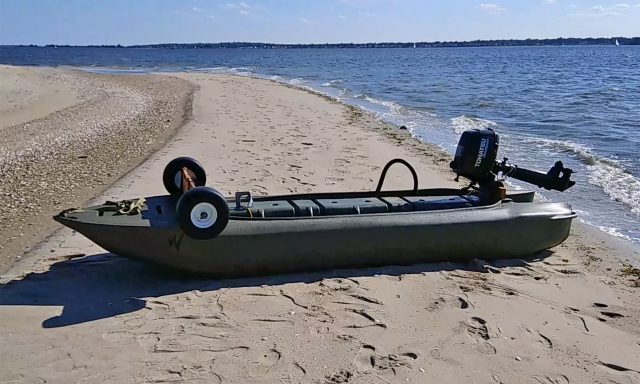 The smaller size saves money on gas and maintenance, but the need to transport microskiffs on a trailer still presents a challenge in terms of launching and beaching, as well as storage. At the lowest end of microskiffs both in terms of size and price, is a group of large size boards, some of which feature backward pointing extensions that provide extra support for the outboard motor’s weight, and some that don’t. These boards usually offer enough stability and load capacity for just one user (I.E. “solo” skiff), and they hardly offer any free board, which pretty much guarantees that this user will get soaked, whether they like it or not. As far as comfort is concerned, these large size boards marketed as microskiffs or “solo” skiffs seem to be designed with no concern for ergonomics whatsoever, to a point where watching a video featuring such a skiff might give the viewer an uneasy feeling. In terms of portability and transportation, their small size allows for an unusually strong person to transport one on a pickup truck bed, but car topping such a vessel is beyond reach for anyone who’s not a professional weight lifter. Most of these board type skiffs are molded from fiberglass or other cold-molded resins, which reduces their impact resistance, durability, and therefore reliability. 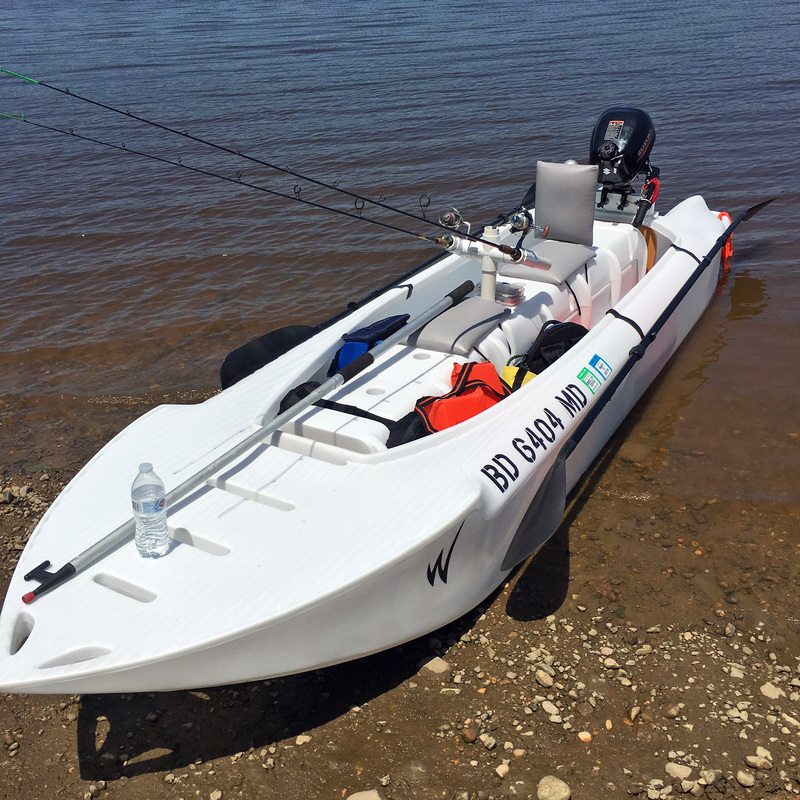 Despite their small size, including a beam (width) that’s narrower than the beam of conventional skiffs, board skiffs do not paddle well, a factor that reduces their appeal to anglers who fish skinny water and water where aquatic vegetation abounds. 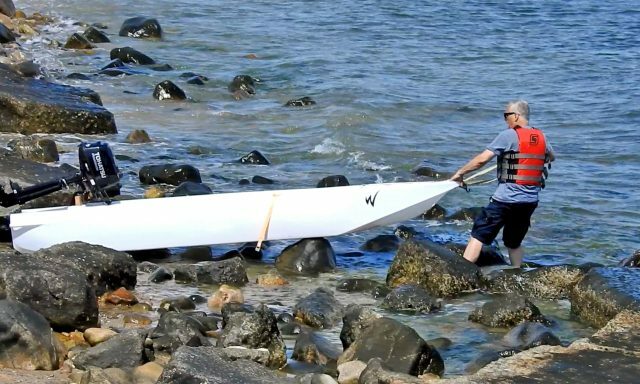 In physical terms, the Wavewalk S4 is smaller and much lighter than any skiff, microskiff, and board skiff, and it its Polyethylene hull makes it more resistant to impact. It is the only skiff that anyone can car top without help from a second person. The S4 can carry up to three adult fishermen on board, which is comparable to the crew size of good size skiffs, and it enables these anglers to fish at the same time and standing up, which is something that only full fledged medium sized and bigger skiffs may offer. The S4 is a much seaworthy skiff that can be driven through ocean waves and other choppy waters without problems, both in a solo mode and with a second passenger on board. 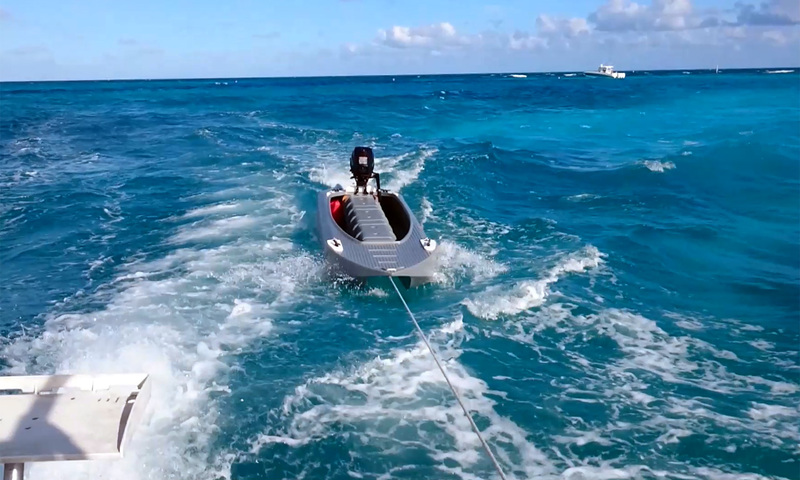 The patented combination of its twin-hull (catamaran) and saddle seat is extremely stable as well as easy for the users to balance, even more than a personal watercraft (PWC). In fact, driving an S4 in the ocean and in choppy water is pure fun. The S4 offers plenty of free board, which is good news for passengers who are looking to stay dry, and it is the only skiff that can serve as a tender for a big boat or a yacht. The S4 offers its passengers to use the entire internal space of its twin hulls for on board storage, and this makes its storage capacity rival with full fledged and good size skiffs. 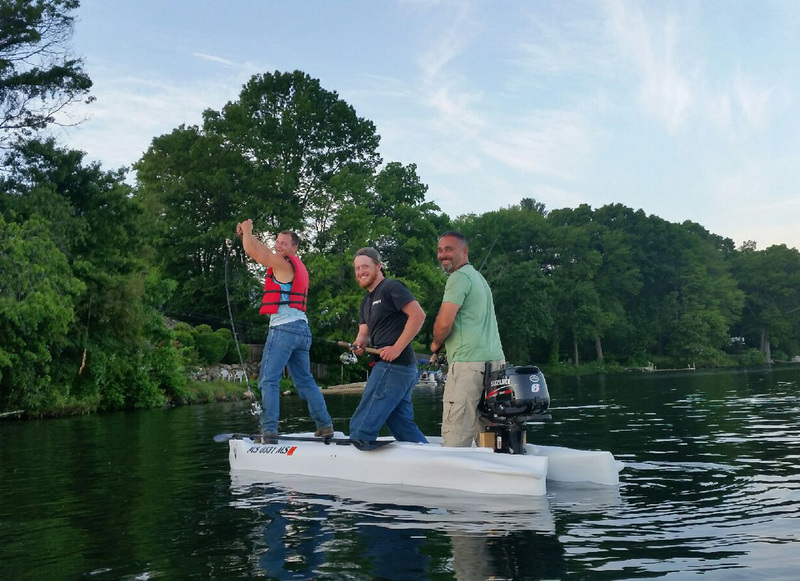 Like a full fledged skiff, the S4 can be easily outfitted with a front mounted electric trolling motor. And unlike any other skiff, including the smallest board-type microskiffs, or kayak skiffs, the S4 works really well as a paddle craft, namely kayak or canoe, to a point that some owners use it as a fishing kayak, without even motorizing it. Typically, the S4 is used with outboard motors in the 3.5 HP to 6 HP range, but it can be powered by bigger motors. In sum, the S4 is a craft that’s so advanced in performance and versatility that it deserves a class of its own. Three Wavewalk S4, six divers, paddlers and anglers, and plenty of fish! 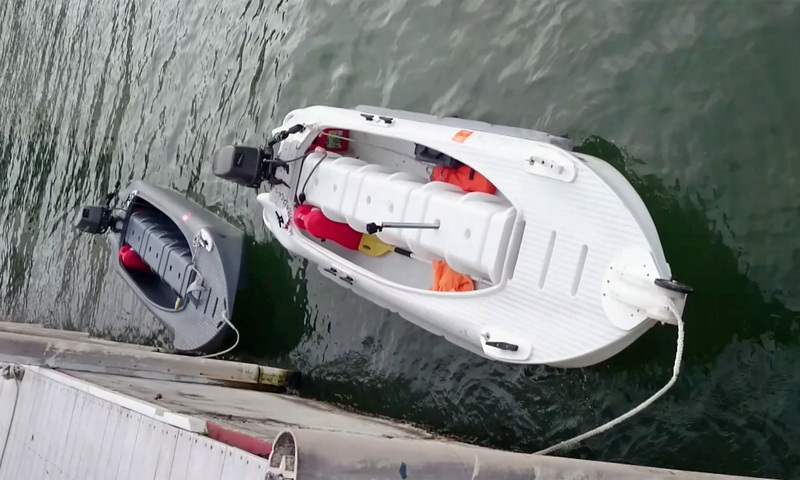 Three Wavewalk S4 attached together to form a super stable drive & dive platform, and each paddled separately by three tandem crews of mangrove anglers. I am very pleased about the Wavewalk 700 . It is a very easy craft to get in and out of. It is a very stable craft for older people to feel safe in. 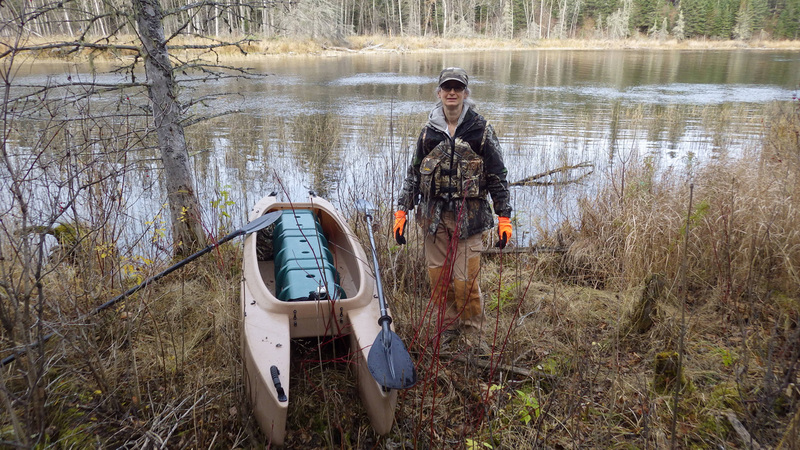 As an retired Canadian Outfitter and Guide for fishing and hunting, there is definite use and purpose for the Wavewalk in my outdoor activities, leaving the other four canoes, three kayaks and one twelve foot aluminum boat at home that I already had. Last fall I used it for fishing and goose hunting with my gun dog. We have some great videos with a go-pro but can’t seem to post them on you tube for some reason? The ice believe it or not is still on the lakes this spring. 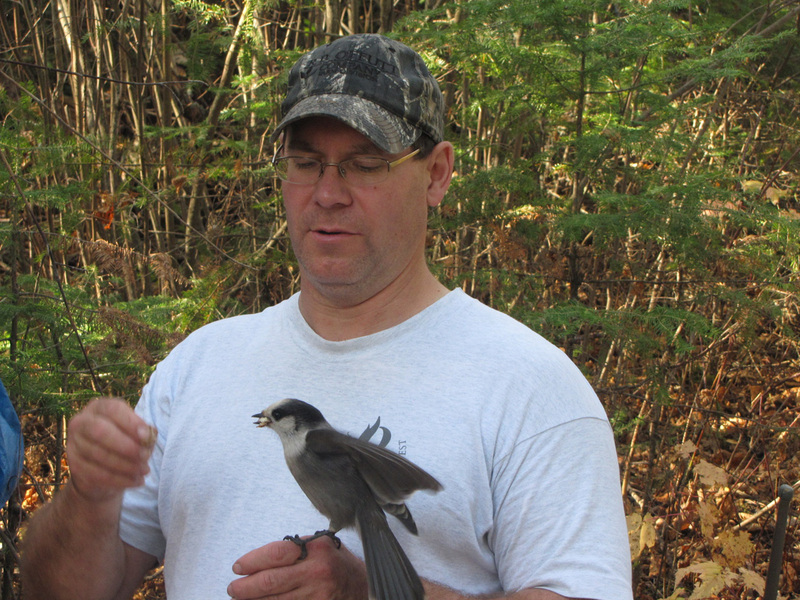 I was ice fishing for Lake Trout three weeks ago. Lots of work to do this spring. Tear down the old cabin (Had it from 1966, until now), and build a four seasons home in the bush, one hundred miles from where we are now living. Will have to sneak in some kind of time, somewhere for the Wavewalk, but don’t know where this spring? The only thing I am having trouble with the Wavewalk is, that here in Canada, the plumbing pipe sizes don’t match the American plumbing pipe size holes, in the seat to make accessories for the craft at this time. I am sure at some point in time, after building our home in the bush, I will find away to get the right size plastic pipe, and stand attachments for bolting onto the plywood to make all my ideas I have in mind. 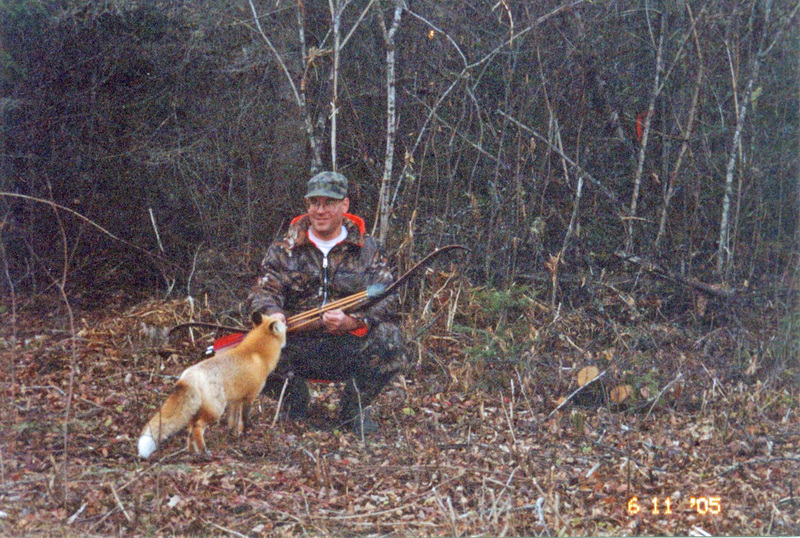 Too bad I am retired now from Outfitting American clients, because they could have brought some pipe and attachments up with them, when they came up hunting and fishing with me.